Aurora Lighting Hire’s recent move to new purpose built warehouse facilities in Greenford, West London has coincided with a rapid take-up on their new SGM X-5 LED strobe inventory, as an increasing number of TV lighting directors and moving light operators turn to this new age solution. The feedback was so positive, that Aurora has now more than doubled its stock of X-5s. In addition to their popularity with lighting directors and have also been successfully dry hired to touring lighting companies. As a result of Nick Edwards’ recommendations, the X-5s were quickly appearing on high profile shows. The highly experienced Mike ‘Sooty’ Sutcliffe fielded two fixtures on each side of the stage to punctuate Lady Gaga’s memorable performance of Venus on a recent BBC1 late night Graham Norton Show (from London Studios) where they were used to fire into some mirrored set pieces. Standing in for Chris Rigby, this was the first time Sooty had broken from using conventional xenon strobes, and he was thankful to Nick Edwards for suggesting he try them out, after he had seen them featured in Gurdip Mahal’s lighting design for Staying In at Pinewood Studios (a show that Sutcliffe himself subsequently used them on). The lights were programmed and driven by moving light operator Theo Cox, another who has used the strobe on frequent shows. Another lighting operator who has been won over is Ross Williams. He has been using Aurora Lighting’s X-5 on popular productions such as Staying In and Your Face Sounds Familiar. He also took a demo pack of 12 SGM SixPack blinders on the major BBC marathon fundraiser, Children In Need recently. Working again with leading TV lighting designer, Gurdip Mahal, the SixPacks were mounted on the floor dollies to enhance performances by bands such as JLS. Said Ross, who is also a director of Aurora Lighting Hire: “The SGM strobes were first brought to our attention by colleagues who had seen them and thought they would appeal to us — Aurora are always on the lookout for new exciting products to add to our rental stock.” Since replacing conventional strobes with six X-5s on ITV's Your Face Sounds Familiar, he has used them regularly/. “They are firmly on our favourites list now,” he confirms. As for the SixPacks, Ross commented on “the bright saturated colours” which he senses will prove highly effective on larger shows as audience blinders. 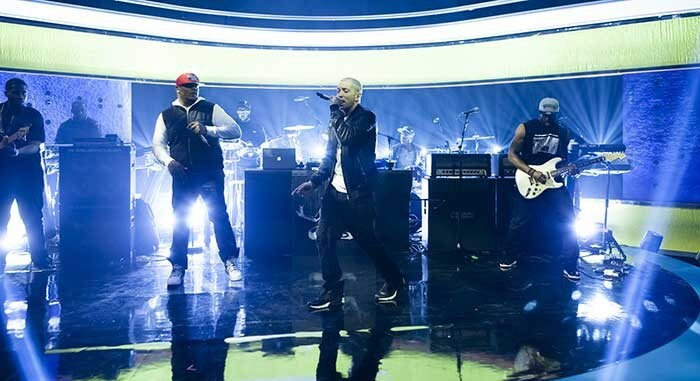 Other high profile shows using the X-5 — this time with LD Oli Richards at the helm — have included Robbie Williams: One Night At The Palladium, which was recorded for DVD and BBC1 broadcast, and he also used eight on the Jonathan Ross Show to highlight Eminem’s performance of Berzerk. On the Williams show, the LD placed six X-5s in the rig — four attached to the set and two of them placed inside very large gold closets — which sprung into life when Robbie and Rufus Wainwright sprung from within in pink glittery top hat and tails to celebrate their ‘coming out’ in Swing Both Ways. These were triggered from a Hog 4 console. Finally, back at Children In Need, one of the highlights was the EastEnders sketch, with the soap stars performing on the familiar Albert Square lot at BBC Elstree Studios. In the breakdance sequence LD Bernie Davies and moving light operator Russell Grubiak used them to dynamic effect. But the final word comes from Ross Williams, who summed up the advantages these strobes will increasingly offer lighting directors — and television light entertainment in general. “I have been very impressed with the new SGM products in terms of both performance and build quality. I like the menu structure with nice little touches such as letting you know the next available DMX address, which tells me someone has really thought in detail about what they are making.